A group of utility workers contracted by Con Edison and National Grid "likely" cheated on their certification exams in order to qualify for their jobs, calling into question the quality of work on some gas mains and pipes across New York, state investigators say. The I-Team has learned that Network Infrastructure, Inc. pipe installation workers had access to and "likely used" answer sheets for a written portion of operator qualification tests administered by the Northeast Gas Association. The tests measure how much candidates know about installing natural gas mains and pipes. "These findings are deeply troubling, and they should concern every New Yorker who's concerned about their safety," said New York City councilman Eric Ulrich, whose district in Queens includes a decades-old gas main on Rockaway Boulevard replaced by Network Infrastructure last June. Con Edison and National Grid were ordered to immediately stop using Network Infrastructure workers on their projects. The companies say they're cooperating with the state's investigation and that they'll proceed on projects with other contractors and company resources. "We hold utilities and their subcontractors strictly accountable when they do not comply with our rigorous gas safety rules," said James Denn, a spokesman for the Department of Public Service, which conducted the investigation. Patrick Clarke, the president of the Long Island-based Network Infrastructure, Inc. denies the company gave employees answers to the exams. He told the I-Team from the company's Hempstead office that he's been in business for 16 years and that he's cooperating with the state investigation. "We are devastated," he said. "We think there was a rush to judgment." Later in a released statement, Clarke said, "Network Infrastructure takes the safety and the quality of our work very seriously. At no time did any employee perform any safety sensitive task that he/she was not fully trained and qualified to perform." "Notwithstanding the fact that our field workers were not given the answers to the operator qualification tests, Network has retained K2 Intelligence Inc. to conduct an independent, full fact finding investigation," he said. 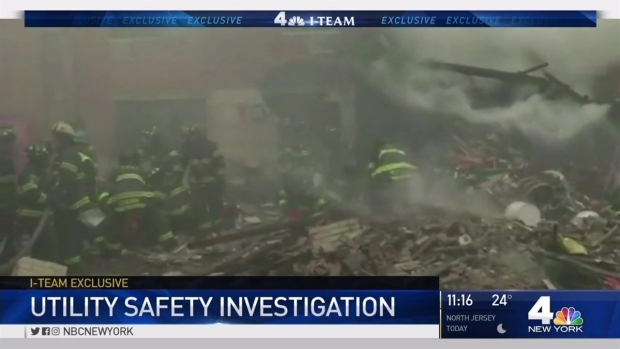 The statement went on to say that the company will "continue to fully cooperate" with the investigations and will share its own investigate report with Con Edison, National Guard and the DPS. Con Edison and National Grid have started their own internal quality assurance investigation by testing sections of Network Infrastructure-installed pipe, DPS officials say. It's not yet clear how many miles of installed pipe will need to be reexamined, but officials say it represents only a small percentage of the overall new gas pipe installed. "We need to go back and inspect all the work they've done to make sure it's not shoddy or dangerous, and moving forward we need to take a closer look at the qualifications people have for installing these gas pipes," said Ulrich. The current written tests administered by the Northeast Gas Association are no longer being used to qualify pipe workers, the DPS said. Con Edison and National Grid are also working with the NGA to identify integrity problems and solutions to prevent another breach. "It's outrageous that they were given answers to the questions, a complete bypass of a safety check that's designed to protect the people," said NatGas Consulting's Mark McDonald, a nationally recognized expert on natural gas safety. "It's critically important that these people are properly trained to prevent catastrophic consequences," he said.